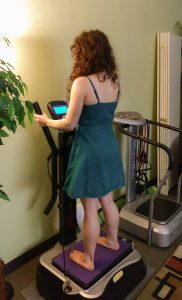 Whole Body Vibration (WBV) is a scientifically-advanced approach to a thousand-year-old practice. It uses high-tech equipment to vibrate the body while standing on a platform that vibrates rapidly in either an oscillating or a linear direction. The rapid vibrations cause the muscles in the body to react to the vibrations on a micro level, contracting reflexively. These tiny muscle reactions lead to numerous health benefits. This movement goes in a pivotal direction to mimic walking. It causes the engaged muscles to contract alternately, so the muscle groups on each side are not contracting at the same time. This type of vibration is low-impact and maintains spinal flexibility, and improves balance and coordination. This WBV movement is higher impact, as it vibrates vertically to stimulate the jump reflex. When used in this way, the muscles on both sides of the body contract at the same time. Linear WBV is popular with athletes, as it helps improve jump height and improves muscle tone. The vibrations engage nearly 100% of the muscle fibers in the body. The muscle responses stimulate the body on a cellular level, leading to healthier bones, organs, and other soft tissues including the glands and the brain.